Should have longer life than hid's too. I'm a fan of brighter lights but I hate getting flashed all the time. We are starting to get them in at work. The kits are pretty badass, way nicer than any of the Chinese HID kits around. The actual LED is huge, about 3/4", (one LED on single beams, 2 on Hi/Lo bulbs) which in the history of LEDs is pretty big. The think that I didn't expect was the on-bulb fans. I always thought that LEDs ran much cooler, and lasted longer than traditional bulbs. The kits we have, have a about a 1.5" square fan setup hanging straight off the back of the bulb, so if you have a battery, or washer fluid reservoir right behind your headlamp assembly, these are not for you. That fan also requires it's own power hookup, so another set of wires for each bulb. They have an external ballast/power supply like an HID kit, so not much different there. I don't think they are available in as many colors as the HIDs are, but that may be based on the nature of the LEDs themselves. I am needing to upgrade the lights in my truck, and I have used DDM Tuning HIDs in the Jetta for a couple years and had no problems, but I have heard rumors in the industry that the HID bubble is about to burst. I have even heard that PIAA will no longer be developing incandescent bulb technology after Q3 of 2015, in favor of LED. The HID kits are just so damn inexpensive these days, I have a hard time jumping on the LED bandwagon just yet. 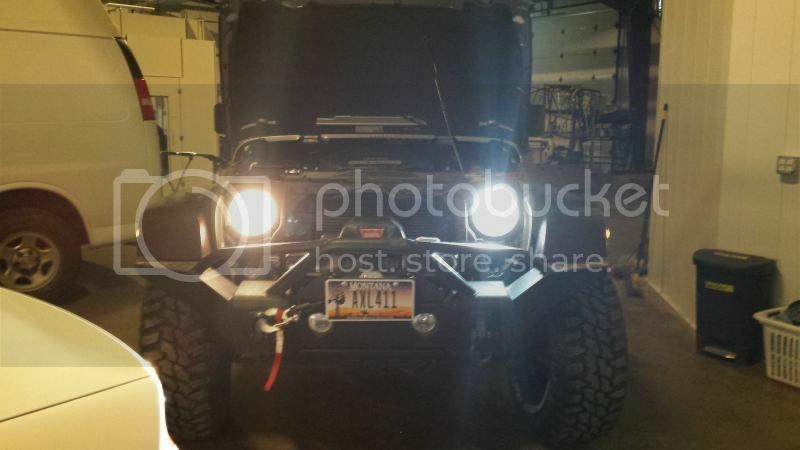 Light output of the LED kits is very comparable to the HIDs, but they run cooler, have instant start up, and last longer (in theory, I don't think they have really been on the market long enough to back that up) This is a pic of a set in action, Passenger side is standard incandescent bulb, Driver is LED. This was in the shop with most of the lights off. 201motels wrote: Should have longer life than hid's too. I'm a fan of brighter lights but I hate getting flashed all the time. Get your headlights aimed! I run HIDs all the time in the Jetta, and never get flashed. I have awesome light coverage as well. Oh, wait. Did you get the 55w 10000k bulbs or something ridiculous like that? Rennwagen1 wrote: Oh, wait. Did you get the 55w 10000k bulbs or something ridiculous like that? Yep I got the hella ricey purple bulbs and put them into stock headlight housings with no proper retrofit projectors. Is it in an A4? I just saw one exactly like that! There's a few cars around town with hid's in stock headlight housings that don't have projectors. Pretty easy to tell when they're in oncoming traffic. To be fair though I did install a hid kit in one of my old Subarus years ago. They were bright but I lost my brights and got flashed alot because the light was scattered all over the place. Not kewl. See I have them in regular (aftermarket) non-projector housings and get really good coverage, and very little scatter. Mine are made by Hella though, so maybe ze Germans did it right? Renn can you post a picture of kit you are talking about so I can see the size of the led / bulb . I can really see the difference in the picture with the jeep. I have looked at some kits on line for about 70ish non China brand lol. Thanks for the input it's greatly apreaseated. Interesting. What's retail on those LED bulbs?